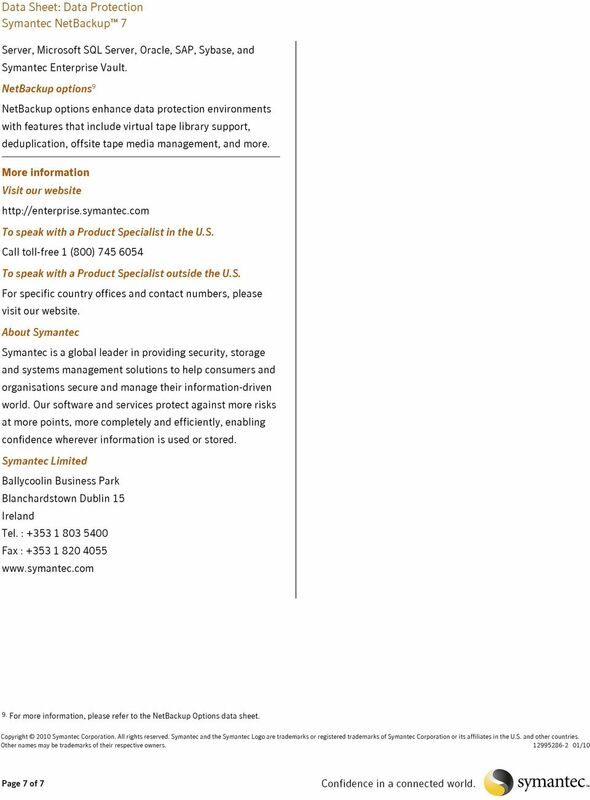 Download "Symantec NetBackup 7 The Symantec NetBackup Platform: Complete protection for your information-driven enterprise"
4 Reduce the cost of storage NetBackup enables Improve backup recovery speed with archiving organisations to leverage commodity disk servers Data reduction for primary storage is equally important which can enable a more cost-effective flexible follows Symantec s strategy to deduplicate as close to the solution. Reduce storage consumption Organisations can get up to a 20x reduction in overall storage versus traditional tape-based approaches. Faster restores With deduplication keep more versions source as possible. 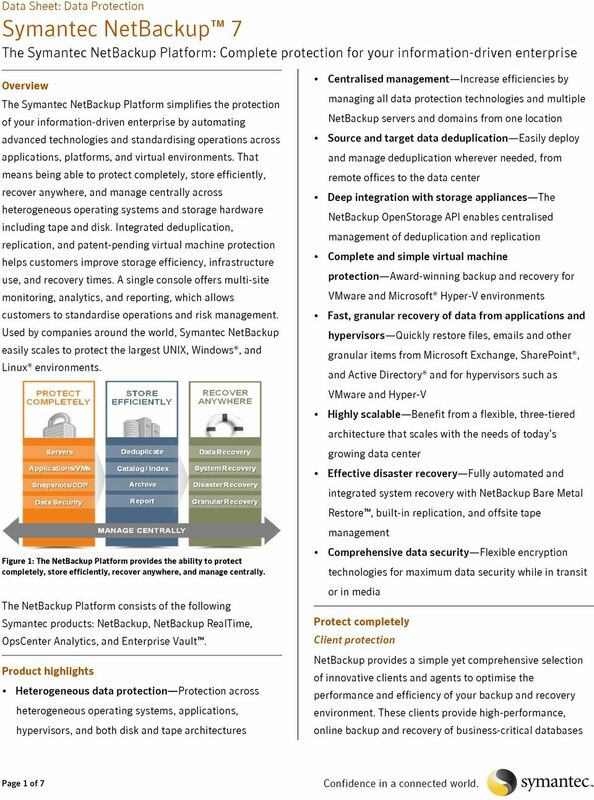 The solution for reducing primary data growth at the source is Enterprise Vault, a recognized leader in archiving E-Disovery. The combination of data protection with archiving enhances traditional backup recovery. NetBackup Enterprise Vault provide integration for automatic, policy-based of data locally, online, eliminating the need to perform migration of archived data from disk managed by Enterprise individual restores from tape. Vault to tape or other media managed by NetBackup. For protection of an Enterprise Vault environment, NetBackup provides an agent that automatically discovers the various servers components within an Enterprise Vault environment. Recover anywhere NetBackup provides a variety of technologies that ensure data can be recovered quickly, even instantly, from anywhere, with minimal data loss. Bare Metal Restore (BMR) Integrated included at no extra charge, Bare Metal Figure 4. 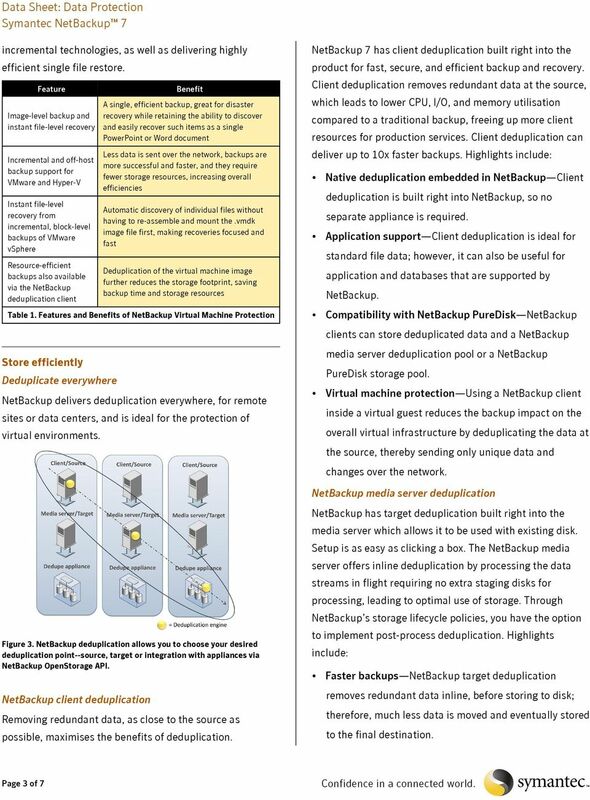 NetBackup allows for easy monitoring of backup job deduplication ratios status. Restore provides all the files services necessary to perform system recovery, including the ability to perform diskless network booting, temporary OS installation, Integration with deduplication appliances via NetBackup disk configuration. This feature boasts a complete system OpenStorage3 recovery time of approximately 15 minutes on any platform. 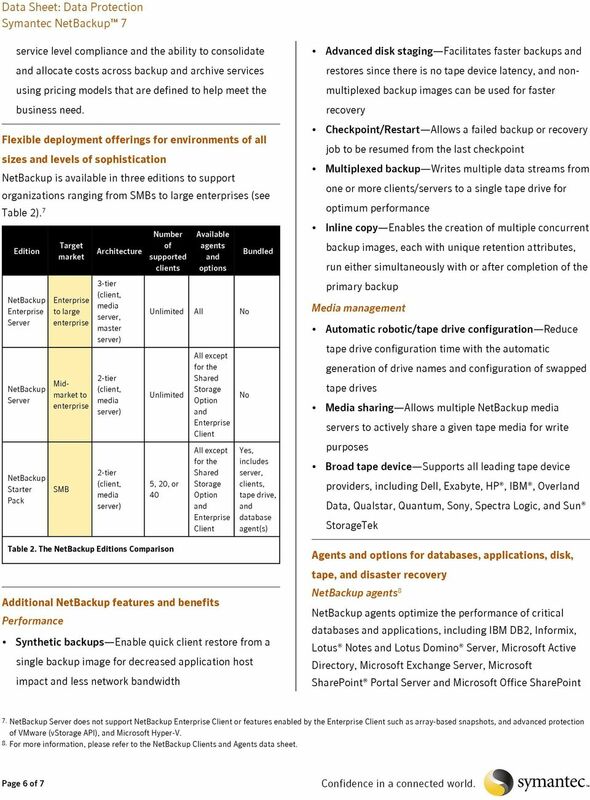 Many deduplication appliances are essentially virtual tape Effective disaster recovery libraries which are based on disk technology, but emulate The NetBackup Platform provides a variety of ways to move tape. The NetBackup OpenStorage API allows NetBackup to data offsite to a disaster recovery location in the event a see disk as disk. The whole concept of tape emulation goes data center is no longer available, whether due to away, allowing users of storage appliances with environmental or other factors. 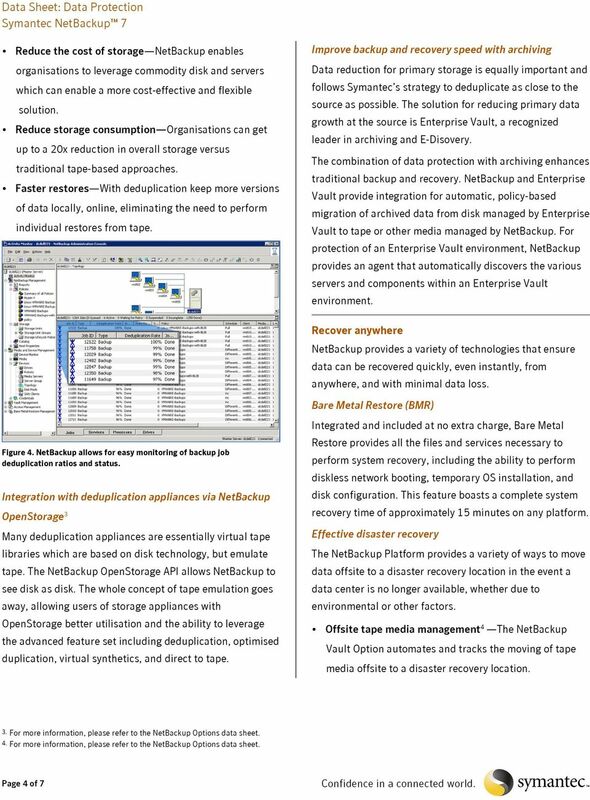 OpenStorage better utilisation the ability to leverage Offsite tape media management4 The NetBackup the advanced feature set including deduplication, optimised duplication, virtual synthetics, direct to tape Page 4 of 7 Vault Option automates tracks the moving of tape media offsite to a disaster recovery location. Veritas NetBackup for Epic Healthcare Protection Who should read this paper Healthcare information technology practitioners that have or are considering an Epic Electronic Health Record (EHR) solution. 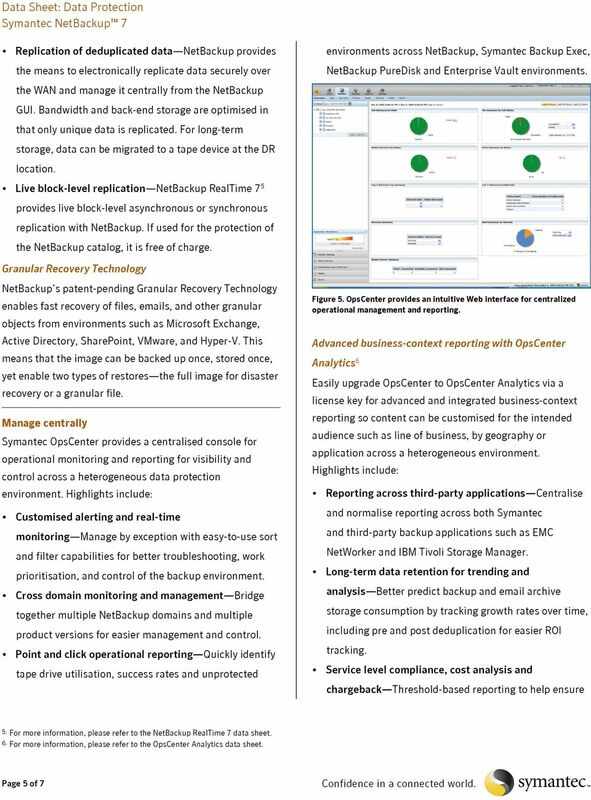 Dell Backup & Disaster Recovery Suite. Resiliency without compromise. 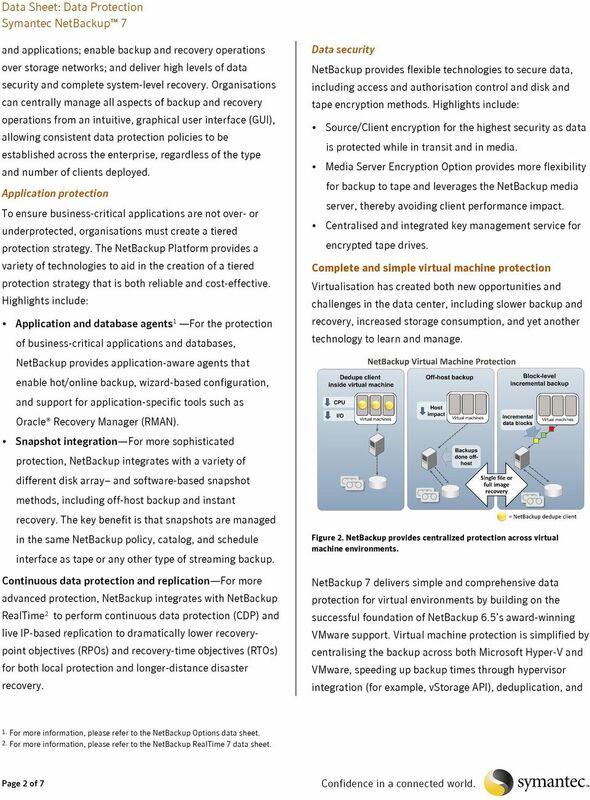 WHITE PAPER: DATA PROTECTION Veritas NetBackup for Microsoft Exchange Server Solution Guide Bill Roth January 2008 White Paper: Veritas NetBackup for Microsoft Exchange Server Solution Guide Content 1.